If you are a return visitor to my site I’m certain you have seen the word ‘Kerdi’ mentioned several times. 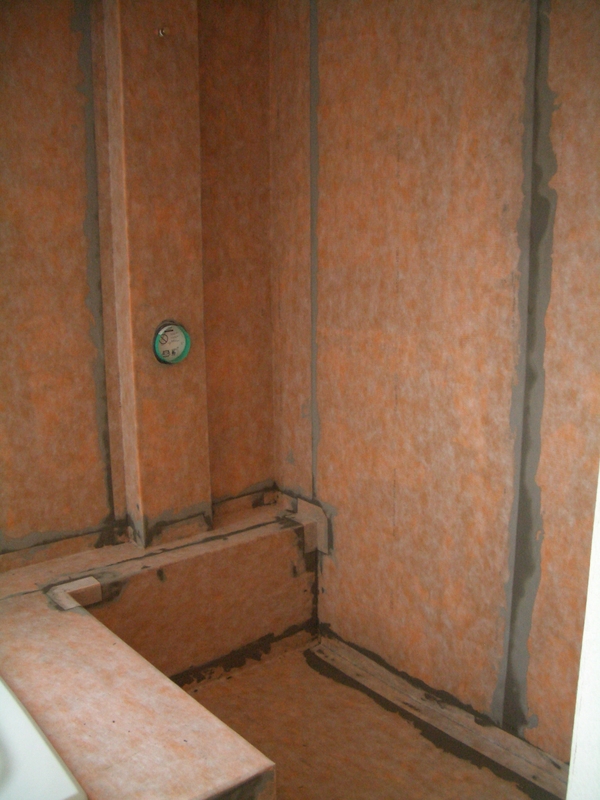 For those unfamiliar with kerdi and what it does this post will describe some basics about the membrane and why it is our preferred method for waterproofing a shower. Kerdi is a polyethylene waterproofing membrane with a bonded fleece attached to each side. 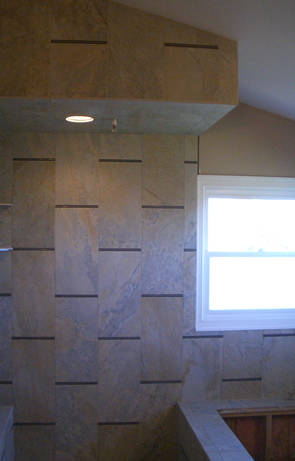 It is installed directly to drywall or cement backerboard with thinset. 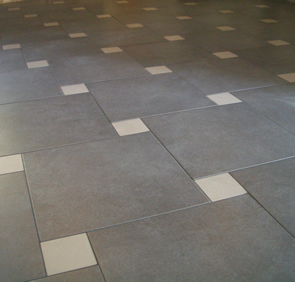 Each seam is overlapped two inches and when correctly installed it will create a large waterproof box ready for tile installation. Once installed the tile is adhered directly to the kerdi membrane. 1. Kerdi allows your shower to dry out much more quickly after use. 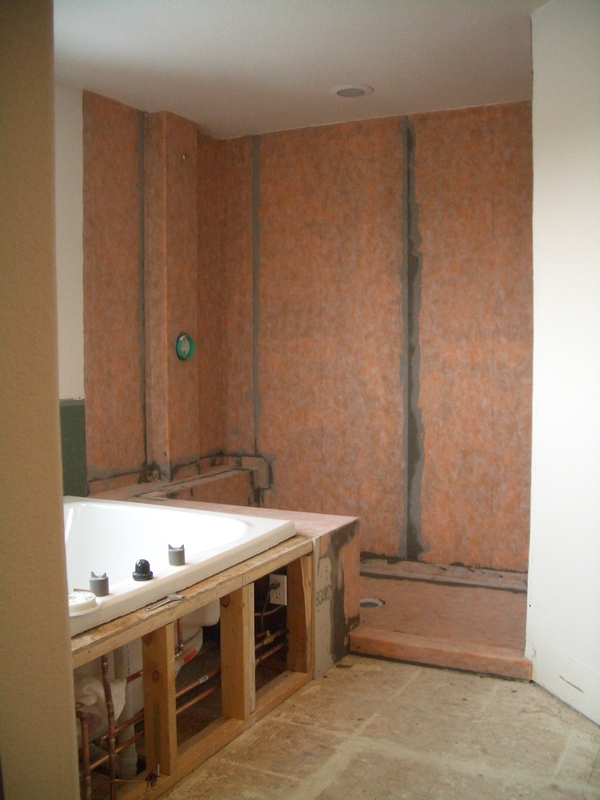 With a normal backerboard shower a moisture barrier is placed behind the backerboard over the wall studs. 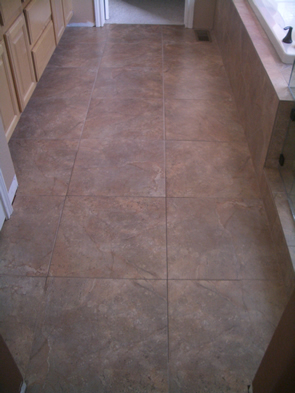 Your backerboard is then installed over that and the tile adhered to it. 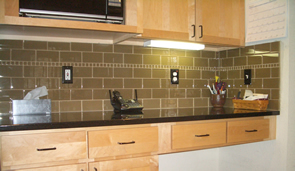 This layering method, while absolutely acceptable, will allow any moisture penetrating behind your tile and grout to saturate your backerboard substrate. While cement backerboards are water resistant and dimensionally stable when wet, they are not waterproof. They simply do not swell, warp or twist when they get wet. 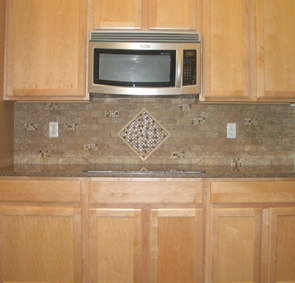 Since tile and grout are not waterproof, even when sealed, the backerboard will eventually get wet. Once this happens it will take time for gravity and pressure to flush the water down into the drain. 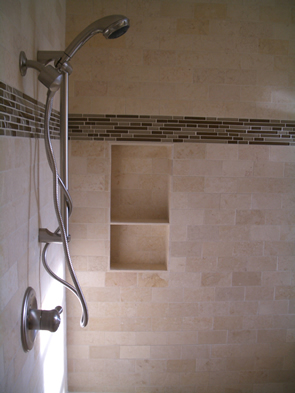 This process allows water to remain in your shower walls for a period of time dependent on the frequency of use. 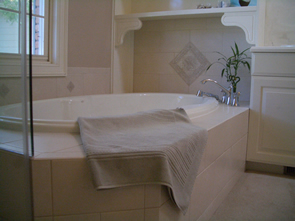 Water remaining in a particular area for extended periods of time will eventually lead to musty smells, mildew or even mold. Kerdi prevents this by not allowing any moisture into your substrate. 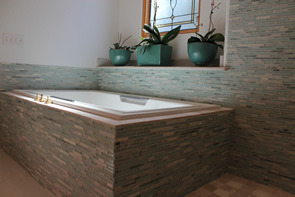 Water that gets behind your tile makes immediate contact with your waterproofing layer and starts making its way down to the drain or evaporates back out through the grout line almost immediately. 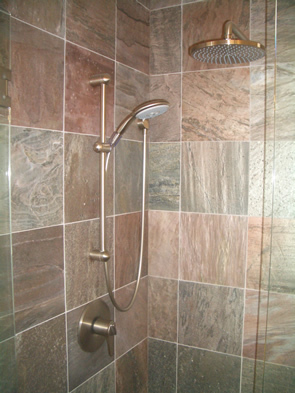 In most cases your entire shower will be completely dry, inside and out, within hours. 2. 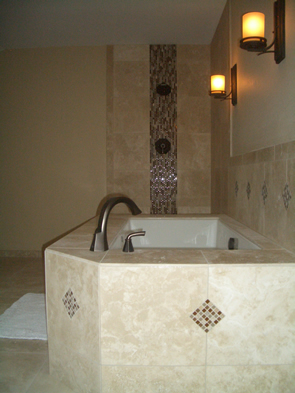 Kerdi does not require a thick mud deck between your tile and membrane. 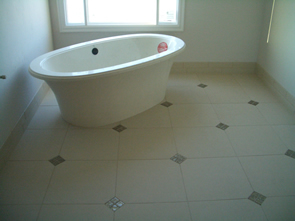 In a traditional shower floor construction the deck consists of three layers – a pre-slope, the waterproofing membrane, and the top slope. 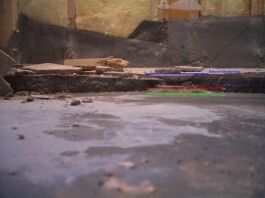 The top slope needs to be at least 3/4″ thick above your waterproofing membrane. Again, this top layer is saturated with water before it reaches your waterproofing layer. And again, it is completely normal. 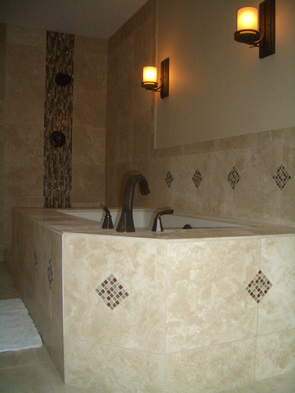 The water is flushed through and replaced with fresh water each time the shower is used. 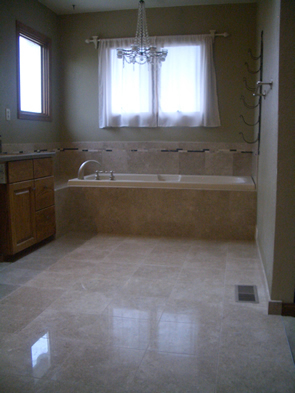 The problems arise, as with most tile installation problems, when the shower floor is not properly constructed. Unfortunately the pre-slope layer is usually skipped either by someone not properly educated in correct shower installation procedures or through sheer laziness. Either way it means the same thing – your waterproofing membrane is laying flat on the floor. The pre-slope layer is necessary to force water reaching it down into the drain. If it is installed flat on the floor any water reaching it will simply stay there. Forever. There is absolutely no way for this water to reach the drain. The bottom flange of a clamping drain actually sets about 1/4″ above the substrate which means the water would actually have to ‘rise’ to drain. Water will not do that. So at best without a pre-slope you will have 1/4″ of water setting on top of your membrane below your tile and shower floor at all times. The photo to the right illustrates what I mean. (You can click on it for a larger version) The blue line is actually the very top of the drain in the shower – where most of the water should go. The black liner is visible flat on the floor and rising up to the bottom flange of the drain. The red line in the photograph is the bottom flange of the drain and should be the absolute lowest point in the entire shower. When a pre-slope is properly installed beneath the liner all that water will drain down into the weep holes located at that level. 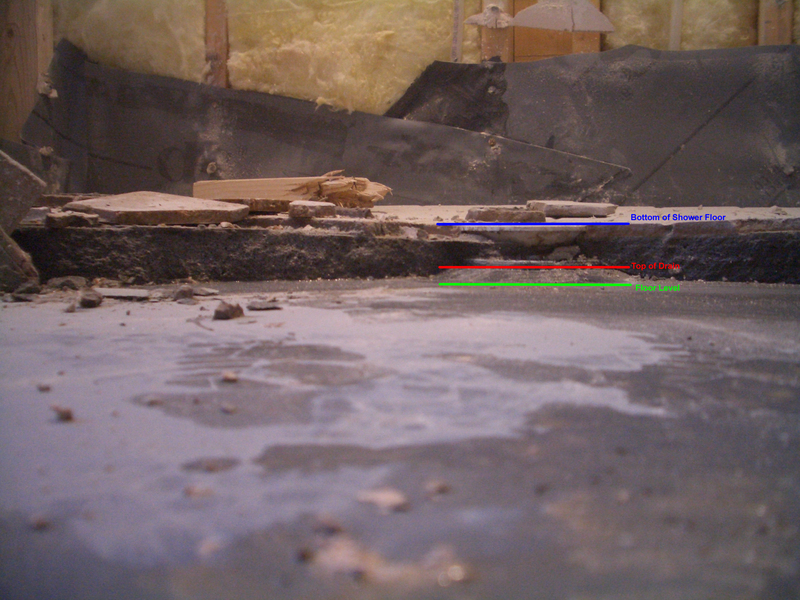 The green line in the photo is the level of the bathroom floor on which the membrane is resting. When I tore that shower floor out it had standing water to the height of that red line. The entire shower floor beneath the deck was full of water between the green and red lines. Of all the showers I’ve torn out and replaced over the last 14 years I have never torn out a shower which was properly built with a pre-slope. Standing, stagnant water beneath a shower floor will eventually lead to all sorts of unmentionable things which have no business in a shower. Unfortunately it is all too common. Even with a proper pre-slope your top layer of deck mud, the one to which the tile is adhered, will remain saturated until flushed through with the next use. Kerdi prevents this in the same manner it does on the walls. 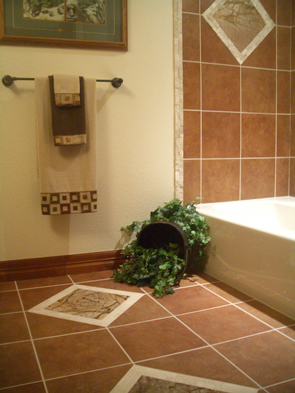 Any water getting below your tile and grout is immediately directed into the drain. The kerdi membrane also requires only a single layer mud deck rather than a double layer. 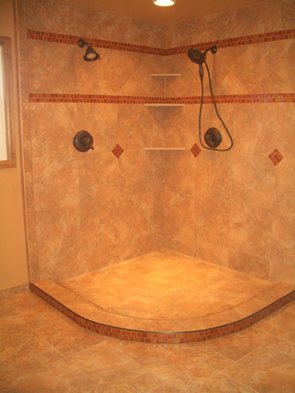 Your shower floor will actually dry out between uses, an impossibility with a traditional system. 3. Kerdi can be used to waterproof nearly any shape or size of substrate. This simply means that just about anything of any size or shape you wish to place in your shower can be made absolutely waterproof. If you would like a round bench – it can be waterproofed. 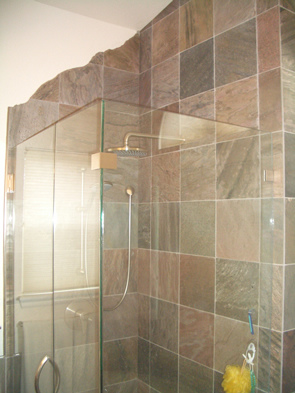 If you want a round niche in your shower wall – it can be waterproofed. Round window – yes. Arched entry – yes. Just about anything. The kerdi membrane is manufactured in rolls which are about three feet wide. Since all that is required to waterproof it is a 2″ overlap of the membrane you can waterproof anything of any size. 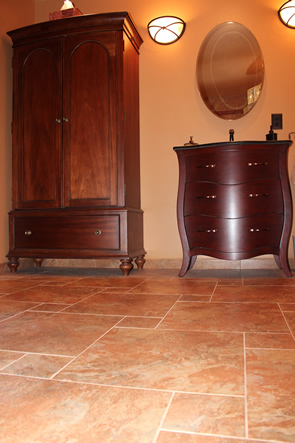 It is simply a matter of ensuring the proper overlap and a proper installation method to achieve an absolutely leak-proof substrate for your tile installation. 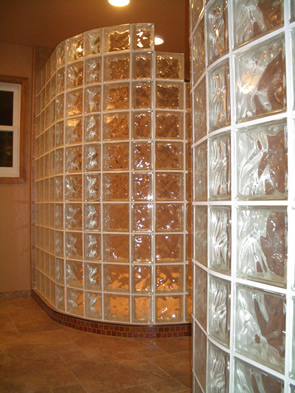 With the traditional methods things such as a built-in niche or oddly shaped windows or entrances required very specific steps and methods to ensure a watertight substrate. If one small step were incorrectly constructed or one thing overlooked it had the potential to compromise the entire installation. 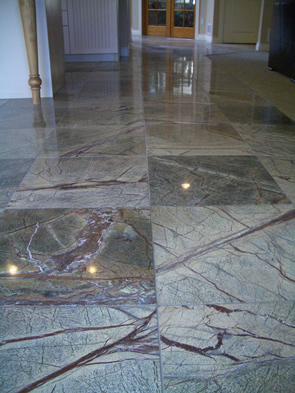 With surface waterproofing if there are any areas not waterproofed it is immediately apparent. 4. 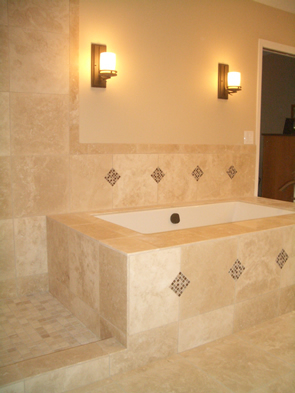 Kerdi provides an absolute mold-free substrate for tile installation. 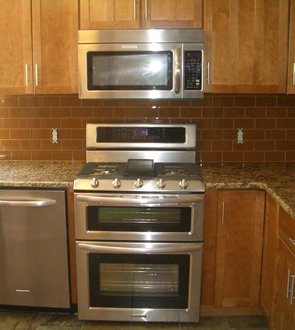 Mold requires three very basic ingredients: food (an organic substance), oxygen and moisture. Remove any of these three and mold is unable to grow and spread. Using kerdi eliminates two of the sources immediately – food and moisture. Since kerdi is a polyethylene sheet, essentially a form of plastic, it does not supply an organic food source for mold spores. Mold quite simply can not feed on plastic. It will be unable to survive. The use of a topical membrane such as kerdi also eliminates excess moisture. 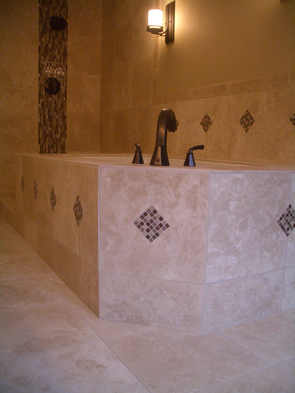 Since the moisture barricade is directly behind your tile installation the water will immediately either evaporate back out or be flushed directly to the drain and the shower will dry out within hours. 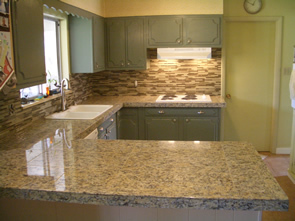 If there is no moisture mold will be unable to survive. The above four reasons are why kerdi is our waterproofing method of choice. 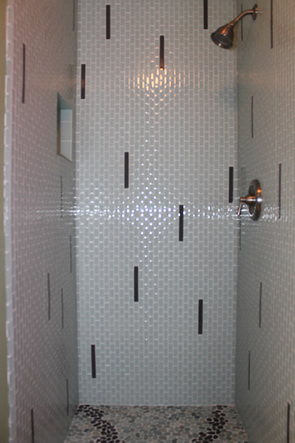 The ability to offer our customers an absolutely watertight, mold-free shower combined with the peace of mind, durability and flexibility of the membrane ensures that our showers will last. If a method provides us a way to offer an absolutely problem-free shower and the ability to offer a warranty above and beyond anyone else we would be remiss not to use it. Kerdi does offer other advantages, most of which are much more technical or trade-related and things most readers would not be very interested in. As far as the end result, though, these four points should be more than enough to convince any homeowner of the advantages of a kerdi shower. 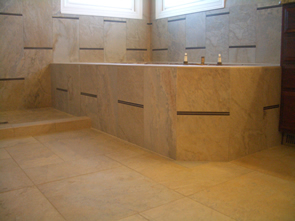 As with any tile installation the substrate is actually the most important aspect. 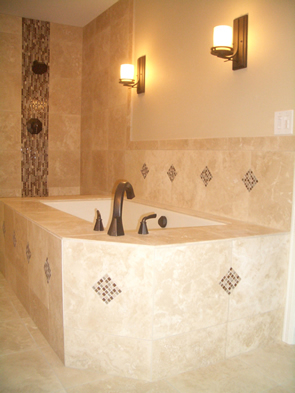 Any tile installation is only as durable as the substrate on which it is installed. 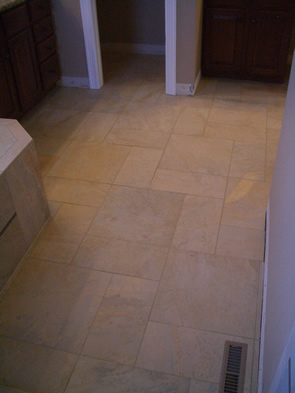 Without proper substrate preparation the tile will fail. 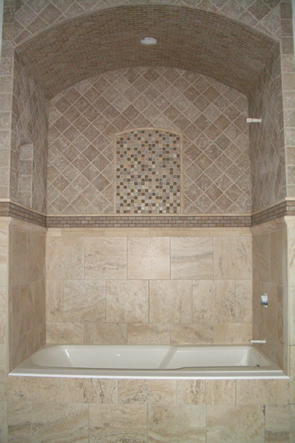 A shower tile installation is unique because of the potential damage which can be caused if the installation is compromised. It absolutely must be done correctly. 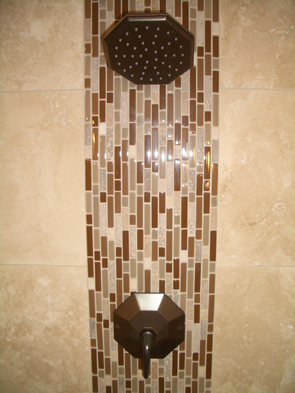 Tile Art also offers the advantages of a Kerdi shower, as well as our full five year warranty, for homeowners who wish to install their own tile. 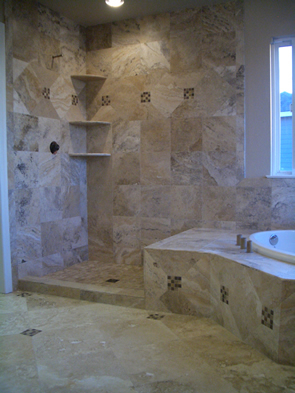 If you are planning a shower remodel and have decided to tackle the tile installation yourself we can prepare your substrate and construct a full kerdi waterproof shower for your tile installation. 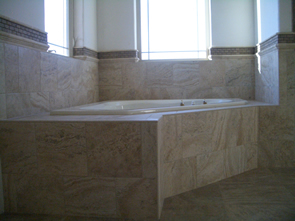 If you want a fully prepared, professionally constructed substrate on which to tile just give us a call or fill out our contact form and we will set you up with everything you need for a shower which will last a lifetime. Let us do the hard part and you can do the fun part. The easiest way to think about kerdi as a waterproofing system is to understand that completing the kerdi installation creates a large waterproof box. 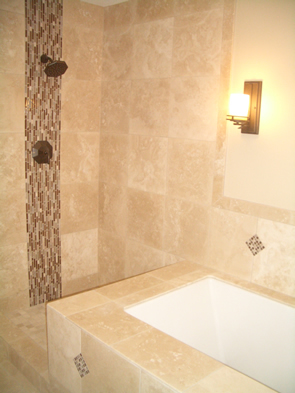 You can actually take a shower in it before any tile is installed. Schluter actually has a video depicting that very thing – it is at the bottom of this page. If it is possible to take a shower before installing tile it proves the waterproofing ability of kerdi fairly well, don’t you agree? 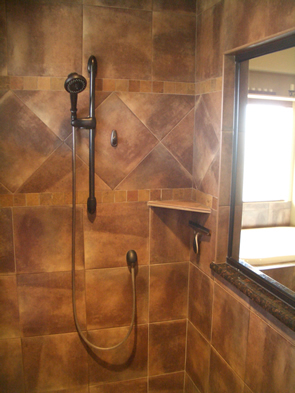 If you need a professional kerdi installation contractor in Fort Collins, Loveland or any part of Northern Colorado just give us a call and have us prepare your shower. 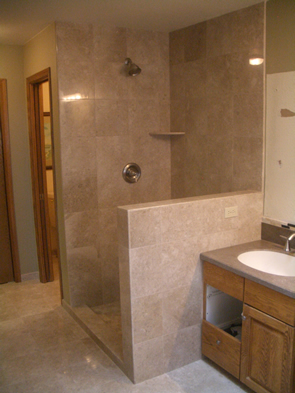 Let us prepare everything and leave you with a completely watertight shower ready for tile. 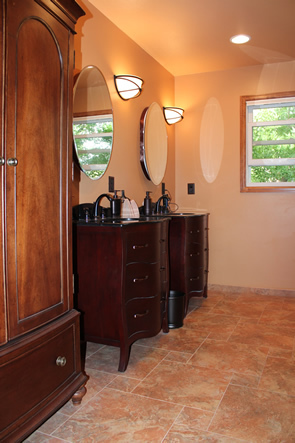 Join us for our New Year’s Remodel Resolution!